All WINDY WALK ESTATES LOT 1- homes currently listed for sale in Scottsdale as of 04/25/2019 are shown below. You can change the search criteria at any time by pressing the 'Change Search' button below. 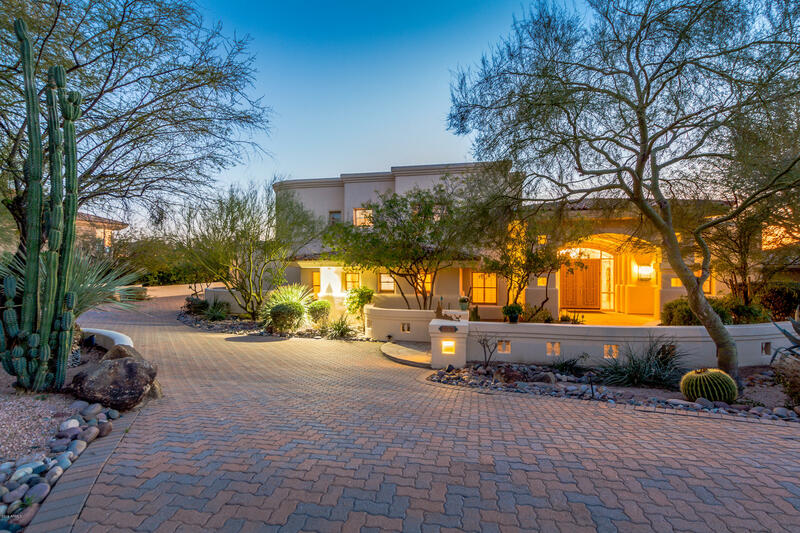 "Representing the ''pinnacle'' of privacy & views, this estate is gracefully situated on the best lot in Troon capturing breathtaking views of Troon Mtn, Pinnacle Peak, city lights & the 6th & 3rd holes of Troon golf course! Timeless soft contemporary design offers highest level of integrity throughout-elegantly appointed w/custom maple doors & cabinetry/granite counters/Idaho quartzite floors/6 FP/large gourmet kitchen open to large family room. This single level home offers 6,634 sq.ft. in main"
"Located in Troon Village's guard-gated Windy Walk Estates, this 6,000+ sqft custom home boasts open spaces, stunning views, and warm charm ready for you to make it your home! This home has 4 bedrooms, 2 offices, and an exercise room accompanied by 4.5 bathrooms spanning the two floors in the main house. The upstairs master with private entry and patio allows for unobstructed sunset views and privacy. Granite countertops and stone accents adorn the bathrooms throughout the home. The detached gues"